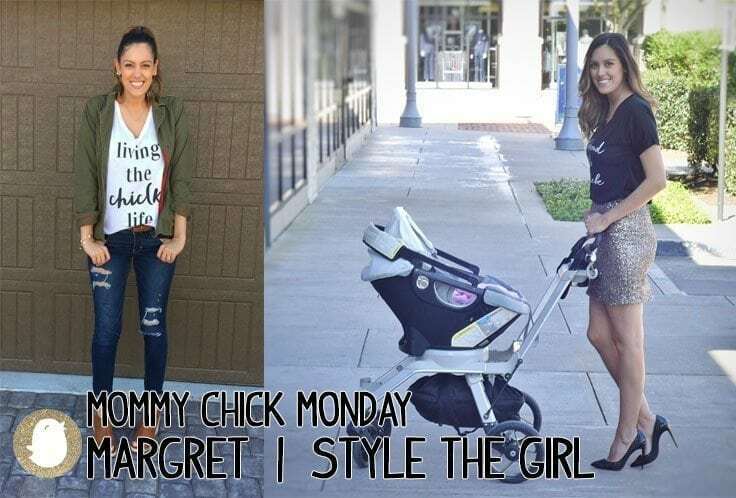 This month for Mommy Chick Monday we are featuring a fashionable and fabulous new mama, Margret Rojas from Style the Girl! She is a fashion/lifestyle blogger from Houston, TX who loves sharing her life and style with the world. It’s been so fun following her and watching her recently become a mother. (She has a 1 month old baby girl!) I had the pleasure of meeting Margret in person not too long ago and after chatting and getting to know her more, I simply adore her and know you will too. To start, congratulations on Sofia’s birth! That is so exciting that she is finally here. She’s a doll! Are these first weeks of motherhood anything like you expected? Any advice that you would give new moms? As for advice, I would say enjoy every day; even the tough days when everything is so hard. We need to remember that ‘it won’t be like this for long.’ Yes, I am totally referencing Darius Rucker’s song, but I think it’s completely fitting. Every time I hear it I can’t help but tear up and think that these moments won’t last forever so take everything in and love it. Such great advice. I know all parents have difficult moments and this tip is something we all need to remember. I have to say, I love your blog. How did you get started blogging, and how did you turn this into your career? I actually started this whole journey by doing the #ootd pictures for a few months on my Instagram. Whenever I would post I always received so much positive feedback from people on social media and from my friends and family. They kept suggesting that I create a blog to highlight all my looks because people loved to re-create them or find out where I got all of my items. At first I was so nervous because I thought to myself, “Why would someone care about my style? Why would they want to follow me?” Finally in January 2015, I decided to take the plunge and create my website! It was such a great feeling but also scary. Now looking back at the last 14 months I am so glad I did because I have met so many amazing bloggers and have been given such wonderful opportunities that I couldn’t be more thankful. Now that you’ve been blogging for over a year now, what is a piece of advice that really helped you grow as a blogger? Be my authentic self!! I think this is absolutely the most important piece of advice that I ever received or that I tell new bloggers. It allows you to build true relationships and connections in the blogging community, and in life. In the world of social media it is important to always be true to yourself and not lose who you are in the craziness of it all. What are the topics or projects that you enjoy writing and working on the most? Yes!!! I can’t wait to see those pictures when Sofia is old enough. That’ll be too cute. You’re such a stylish mama! Where do you get your style inspiration? It is all based on my mood and the event(s) that I am going to. I feel like my style is very versatile because I literally like to wear everything, but I will say that I tend to gravitate more towards neutral tones with classic pieces as of late. A good pair of jeans, a button down blouse, and some heels with personalized accessories is always a go-to for me. Do you have a lifesaving beauty product? Piece of baby gear? For the beauty product, it is under-eye concealer. lol! Darkness under the eyes tend to run in my family so I always use my concealer from Maybelline or MAC to eliminate those raccoon eyes; a total lifesaver for this tired mama! For baby gear, it would be my Owlet that I recently bought. It brings such peace of mind to my husband and I during those late nights because it provides us the ability to see our daughters heart rate and oxygen levels while we all sleep. You can check out more of my post on my website! What do you want women to take away from following your blog and social media? I want them to see my authenticity, from my life to all the things that I love. I try to always be open and share my life with my followers. If they enjoy following and being on this journey with me, that is what fills my heart and continues to motivate me. What does life look like now with a newborn and how do you juggle blogging and your family time? Life is definitely amazing, but also very hectic. Since Sofia is now a month old I feel like I have gotten the hang of balancing and prioritizing items in my day versus how it was in the first two weeks. I am very lucky that I have such an amazing husband because whenever he gets home from work he tries his best to take care of every detail from cooking to cleaning. To juggle blogging right now, I mainly do it when Sofia is sleeping during the day. She still hasn’t learned to sleep more during the night, so I maximize my time to complete my blog posts or plan any events during the early hours of the day. What do you do to de-stress at the end of a long day? Cuddle and relax with my husband, and reality tv. When we get Sofia to sleep around 8pm, I love to just be there with my husband and enjoy that one-on-one time. It’s important we always have some time for each other. Who is your mommy inspiration? Fellow moms that balance it all!! Being a mom is the most amazing but tiring and scary job there is, and I love that there are so many women I admire that make it looks so easy. I also have two blogger mamas that I love and that is Christine from Hello Fashion Blog and Amber Fillerup from Barefoot Blonde. They are not only fashionable women with adorable children that always look so happy, but they both are extremely business-minded women who are able to balance it all. I love that!! What did you learn from your mother about parenthood, and what do you hope to pass on to your daughter? My mom taught me to always be kind. She has a very gentle soul and demeanor and always made me feel comfortable to tell her things that I would never want to tell my dad. I want my daughter to know that she can always tell me anything and I will always be here for her. You most certainly are, Margret. That’s super chic(k) to me! Which mamas are you inspired by? Share with us and they just might be our next featured Mommy Chick of the Month!